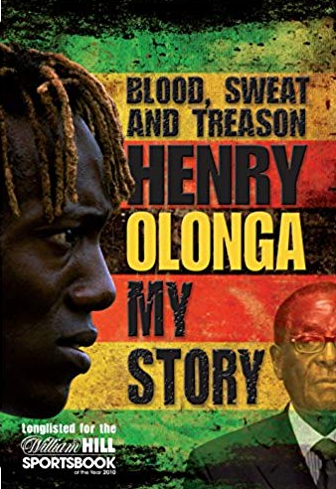 Henry Olonga doesn’t mind admitting his faults, but the book gives him a chance to share what he learned from every experience. I loved his thoughts on mentors and how that’ it’s okay to change your mind about things over time, such as realising Robert Mugabe wasn’t such a hero like he thought he was. We were making a stand for our country’s future: how could we be traitor. When I was seven I was I had an in-built sense that people could not be trusted. Remember, too, that I had been moved from pillar to post and had had very little stability in my life. But as a seven-year-old I did not have a bone of prejudice in me. I remember one teacher telling us that if we heard a shot it meant that we were still alive, that we would never hear the bullet that killed us. By accident, I also found that I had an aptitude for throwing things. Mr Lowe saw some potential in me and made me work hard, telling me that I had the ability to become another Carl Lewis if I wanted it badly enough. I remember watching the 1984 Olympic Games on an old black-and-white TV and seeing Lewis win all those medals, and it really inspired me. I was late for dinner and just wanted to get away but I learnt that anything worth pursuing in life needs commitment. I have always responded well to mentors but I have also been mindful, subconsciously, that they always leave. They come for a time into my life and then they are gone. It’s funny but at that age you don’t fully appreciate the significance of pulling on an international jersey or wearing your country’s colours. To me Mugabe was, and remained, the hero I was being told that he was. I have always believed that it is correct to show some respect to your elders, but surely they have to earn it in some way? Like everybody else, I had bought into the fact that it was OK to pummel somebody we felt had let us down but seeing him in tears stirred something in me, and I felt genuine compassion for this poor boy. It struck me that there were some pretty dreadful things going on in the world if you could be singled out just because of the colour of your skin. But I was starting to look for answers to life’s big questions. I’d always had a nagging sense that there was far more to life than I was experiencing. I felt in my heart that I had heard the truth I was seeking. So, at the age of 16 on 12th December 1992, I decided to become a Christian. I felt free and at peace with God. If ever there was a man I looked up to, a man I wanted to do well for, it was Atherton Squires, and now he was gone. My sporting dreams were shattered. I had been appointed head boy, which gave me the perfect opportunity to try to leave a positive legacy and I thought it would be great to try to change that. Although I loved my athletics, without my mentor my passion for running began to fizzle out. I always believed that if you don’t ask you won’t receive. It is amazing how something that can seem insignificant in your teens may go on to shape your entire life. So I strapped up my ankle and bowled through the pain, taking a few wickets in a rain-affected match but nonetheless impressing the selectors in the process. It was a lesson to me that sometimes you just have to play through discomfort. On my journey to the top I had learnt over time to develop aggression, it wasn’t something that came naturally to me. I bowled hard, but I bowled fair, and I got no enjoyment out of trying to hit a tailender unless they started getting smart. But true power is not having the ability to do something and doing it: it’s having the ability but knowing when to do it and for good motives. We are given skills and abilities to use at the right time but with wisdom. But unless you can get an expert in biomechanics who can come in and fix it for you, or at least point you in the right direction, you are just going to keep doing what comes naturally to you, whether that be right or wrong. Yes, Dennis Lillee’s clinic had given me hope but months after returning I began to suffer from depression and had decided I was going to walk away from cricket. The only thing that was stopping me was how I wanted to be remembered. I didn’t want Mr Bourdillon’s words to be the last word in my career. I didn’t want to be the player who played one Test match, got called for throwing and left the game in disgrace. As you go through life you come across inspirational characters like this guy, people who have suffered the very worst that life can throw at them but who keep smiling, have a positive outlook and rise above it. After my time at the academy, I went home to Zimbabwe with a new confidence and belief in my action. This was going to be one of those times when I would just have to bite the bullet. I had always been told that you never really play at 100 per cent, and sometimes you just have to grit your teeth through the pain barrier. If I wanted to get back in the team I needed to look like a proper athlete and be at my peak. After the programme I felt that I was ready for anything. It is amazing how much you appreciate people when losing them becomes a real possibility. It is true that my dad has made his mistakes in life and he might have made wiser choices, but in that short space of time he became my greatest hero, role model, inspiration and mentor. But knowing when to stop analysing and just expressing myself was always a tough balancing act. He was a hero and that was unquestionable. But that view was about to change. I found it hard to believe at first because it was so shocking but the evidence just kept mounting up. There are some good things that can never be taken away from Robert Mugabe. Perhaps coaches have a shelf life and, after being in charge for about five years, we thought that the relationship between the team and this coach had run its course. Unfortunately, one of the consequences of that fateful team meeting is that cliques began to form and in my opinion it ironically bred a culture of selfishness among players as player power became an increasing force in the game. I have always attempted to be man enough to admit when I have screwed up and so I later apologised to a few of the players involved, individually and also generically in a letter to the then captain Andy Flower. I felt it was my responsibility as the senior black man in the team to stand up for the junior member of the team who could not stand up for himself. It’s just my way. Make no mistake, I was no world-beater anyway and I had an average career. But I am happy to admit that I was more average after that. I had tried to man up and take it on the chin, to never reveal the true extent of my depression. But behind the brave face a certain regression had taken place, back to the child I had been in junior school. I had become unsmiling and introspective and I hated it. This was not me. I was not that kind of depressed, morbid guy any more. Whether we like to admit it or not, most people have their prejudices, but this was malicious and much of it was blatantly offensive. You never know when your last conversation will be with someone and it’s at moments like this that remind us how fragile we all are. Chapter Twenty-Two: Sleeping With the Enemy? I often attempt to read people’s vibes and the eyes hold the key. It has been said that the eyes are the window to the soul. I had been asked to captain the team because I had obviously made a good impression somewhere, perhaps not just as a bowler but as a leader. I mean that I was ready in the sense that death may spring up on any of us when we least expect or invite it. I didn’t want to die just yet though. I had things that I wanted to do with my life. I had a growing feeling that as high-profile sportsmen we should stand up and be counted, that we needed to tell the population that we did know what they were going through or at least that we cared about their fate. They went on and on about it as if it was the only important thing, but what they failed to see is that racism can work both ways. How could it be wrong to stand up for other people less fortunate than you who would never be heard? Seeing the lack of transparency was one of many episodes that drove home the fact that my homeland was not in good hands. Yes, I had been warned of the dangers of the action we were about to take but in my optimism I naively still expected to live out the rest of my life in Zimbabwe. I remember how we had both been tossing things back and forth and agreeing that the worst thing in life was to have an opportunity to effect change, a chance to do something meaningful, and choosing to do nothing. As armbands went, they weren’t particularly impressive, but when I sat down to consider what they stood for the hairs on the back of my neck stood on end. On the one hand brimming with excitement at what we had done and a sense that this is going to change the world, and on the other hand there was this feeling of trepidation because of course there was this ever-present sense of possible doom. I am reminded every day that I owe a latent debt of gratitude to so many people who don’t even know that their loss was my gain. After everything I had been through, it was heart-warming to suddenly discover that so many people wanted to assist me. Just chill out for a week or two and think of life again, because when something so tumultuous and life-changing comes your way you run on adrenaline. The sense of nostalgia intensifies as one gets older. Rich people like to hang around cool people, and particularly sports people. Of course I still talk about Mugabe and what an evil man he is, but I know I can’t make it too serious because that’s not what people are really there for. They are black themselves and they’ve had slavery and everything to deal with, but they can see that a black man can be evil. But some black Africans think Mugabe is unquestionably a hero because the white colonialist is always the bigger enemy. As my new life in England has unfolded, more and more I have found myself drawn away from cricket and leaning towards my music and past interests. As my new life has taken shape I have decided to go back to the things that I enjoyed at school. There are also people who are born with gifts that they never discover. The only reason I can sing is because I’ve tried it. There is a saying that the grave is the richest place because in the grave you will find unfulfilled potential in many people, and that is true. Once that decision was made there was no place for a wuss or a wimp. I had to face the music, not back down or shy away. It was the moment I grew up. In a moment in time I recognised and realised that there are deeper issues to life than entertainment, which is essentially what sport is. You can plough along minding your own business, never criticising, never standing up to things, or you can make an effort. It was a good cause, it’s still a good cause and it still exists: the needs are still there. People tell me that sport and politics should never mix and while I would generally agree with that, I would also say that had I not been in the position I was within the Zimbabwe cricket team then I could never have made my protest in front of such a huge global audience. I feel that what I am doing with my life now makes more of a difference, and is far more worthwhile, than what I did on any cricket field. Zimbabweans felt pride when we won cricket matches, and so did I, but it never really had an eternal impact. I have this naive belief that the more people who know, the greater the chance that something might be done to bring it all to an end. But I know that awareness is just part of the solution. When you are in the evening of your life, perhaps that is the time to think of a long-term legacy.